Practice self-discipline today by NOT holding your tongue. 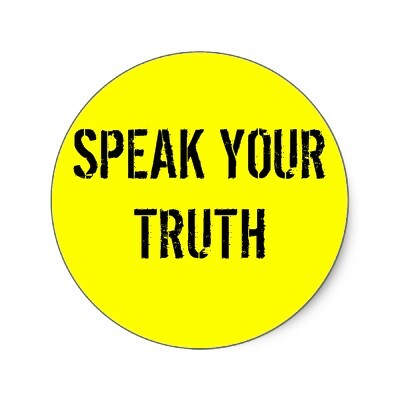 Speak your truth! Allow yourself, and all around you, to be blessed by your actions. i guess today i'm disappointed that you would quote someone who does not profess to be a Christian. after reading his brief biography, i understand that he believes in metaphysics and only claims spirituality which could be anything. so that is my speaking the truth as i see it. i would love that you only quote scripture which is the TRUTH! I thought the story by Mike Robbins was interesting, but I felt one thing was left out... that woman... her story. I know I have had days with my children where I am stressed, they are pushing every button, they are running in two directions, not listening to me at all, all I want is to get a few things at the store and it turns into the most miserable experience ever. I am not excusing her behavior, but if I were at my very last thread of patience and someone came up to me and said that... I am not sure how I would handle it. I agree with speaking your truth... but I am not sure he knew anything about hers. He saw into a small peephole of her life of a few minutes. He didn't offer anything but his "truth" to her and didn't listen to what she might be going through. While I don't condone yelling at the kids and treating them poorly... I can't say I have never lost my temper and wanted to just scream until they would listen. It doesn't work... but we are human and emotions do get the better of us sometimes, especially when under extreme stress. I liked seeing a different story, I like reading different points of view and information so I respectfully request that you continue with posting the different information. Thank you.